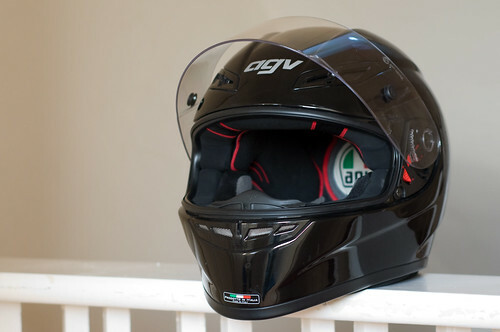 After reading a number of reviews, and spending hours trying on different helmets within various shops, I chose the AGV GP Tech. Here’s how I’ve been getting on with it over the last six months since learning to ride a motorbike. I tried on a number of different brands and sizes of motorcycle helmet before deciding on the AGV GP Tech. I had read that it’s important to make sure that there are not any pressure points and shown how helmets should fit you properly. The guys at Hein Gericke in Stockwell and Metropolis Motorcycles in Vauxhall were both very helpful in this respect. I also found Yam Yam Biker’s GP Tech Review very helpful. Although the Arai X-Spirit 2 was a nice helmet, I was torn between the Shoei XR1100 and the AGV GP Tech initially. These two fit the best, with the AGV GP Tech just winning purely over the tight, but not too tight, feel of the cheek pads. They were both on sale at the time. Since purchase I have been riding almost every week day for three months on a Honda CB600F Hornet. Overall the helmet is very comfortable. The cheek pads fit very snugly around the sides with enough space for my ears and possibly headphones (although I haven’t tried it). The rounded inside roof of the AGV GP-Tech fits my narrow shaped head nicely. The air circulation around the inside of the GP-Tech offers a stream of air which constantly circulates around the inside of the visor. The gaps around my ears do cause some unwanted air circulation which can lead to a sort of reverberation type hollow sound. This is easily solved by the use of a neck tube. The visor is clear, and rarely gets fogged up, unless i’m wearing a neck tube. It’s easily cleaned and using something regularly ensures that the rain slips of well. 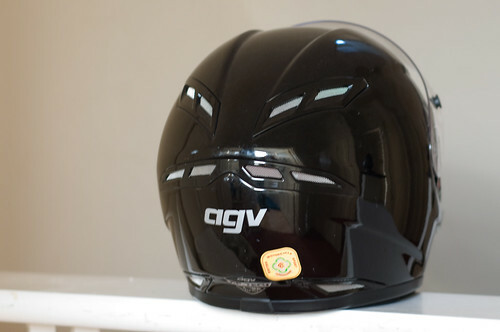 The AGV GP-Tech visor is easy to take out and could be replaced by a darker one should I need. Although I can’t compare the GP-Tech to another manufacturer or model, as this is my first one, so far it’s been excellent. It’s not too heavy, keeps in heat in the winter and out in the summer. The surface seems hard wearing enough against a few dents and scratches, although the paint does come off here and there. I plan to keep this one as long as it will last me. It’s comfortable, light, warm and not too noisy when wearing a neck tube. 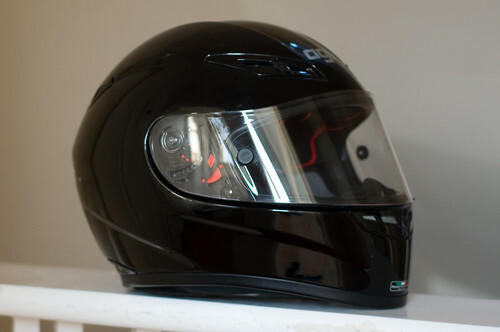 I would recommend it for a first, second, or any other helmet.